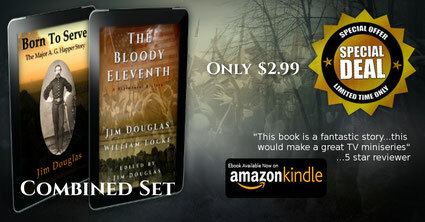 Thanks go to the guys at Plum Run Press for a new Kindle edition of my two new releases, Born To Serve & The Bloody Eleventh. As a Cyber Monday Special they have combined both full length books into one Kindle version. It includes the Bonus section with additional pictures and battle maps. When I was approached with this idea, I wanted to make the price .99 cents. It was explained to me that Amazon Kindle sets the minimum price according to the file size of the book. Since each of my books are full length, it makes a large file download. So, $2.99 is the best we can do. This is for Cyber Monday only, so don't wait. It's available now for pre-order at this price at the link below. Both of my books are still available separately in both print and Kindle editions.